WARP7 (Western Association of Robotics Personnel) is a FIRST Robotics Team from Toronto, Canada with over 50 members and counting. This is the team’s thirteenth year competing in the FIRST Robotics Competition. Each year the team has six weeks to build a fully functional robot made out of several materials including metal and sometimes plastic. Since WARP7’s inception in 2002, they have won 5 Gracious Professionalism Awards (2010, 2011, 2012, 2013, 2014) and the FIRST Robotics Regional in Waterloo, Canada two years ago. Gravic, Inc. is proud to sponsor WARP7, a team who embodies our core purpose, Improving Society Through Innovation, by fostering technology innovation creativity. WARP7 needed a way to streamline their tournament scouting and easily collect feedback from their members on a variety of teams and competitions. Due to restrictions on radio communications to prevent interference with the robots, using paper evaluations is required. Noah Schonewille, Director of Business and Awards with WARP7 explains that “thanks to the selfless contribution of Gravic, last year we were able to use their amazing Remark Office OMR software”. Shonewille states that “[Remark Office OMR] enabled us to efficiently collect scouting data from over 35 different teams at a time. 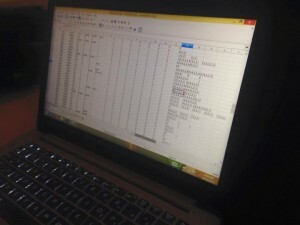 This information is extremely useful while choosing the optimal partner for our team” and goes on to describe how “with this software, we were able to make Robot Scouting Forms that our members used to record match data and robot performance during each regional competition. In total, over 800 forms were used and were all scanned without error. This software also allowed us to easily have all match data in one electronic place in lieu of many handwritten papers, making the task of sorting through all of the data way easier than before. We also distributed the Scouting data throughout our organization for all members of our Robotics Team to view the data and make inferences on potential Robotics Alliance Partners”. After the team designed a form for members to record details during matches, the forms were scanned into Remark Office OMR where they were automatically converted to data. They were then able to export the information directly from Remark Office OMR to Microsoft Excel for further analysis. Schonewille states that “This invaluable software enabled our FIRST Robotics Team to be as efficient as possible and we can’t thank them enough”. Gravic is proud to sponsor the future engineering leaders participating in FIRST Robotics and we wish Team WARP7 good luck in the upcoming FIRST Robotics Season. For more information on FIRST Robotics you can visit: http://www.usfirst.org/roboticsprograms/frc.